Dianes Book Mom Mania and Me is an account of their life coping with her mother Dixie. Her book is a magnificent achievement which would have taken many years to complete, even for such an accomplished author. Dixie was the unstoppable ever-on-the-go-party planner and organiser, high in mania from a bipolar illness. She is organising everyone, shopping incessantly, buying cars and speeding everywhere. Diane recounts with passion of her mothers absurd antics and darker mood which takes a huge toll on family and friends. Diane seeks and finds, ways to escape the trauma (which no one else ever knows about) of Dixies Scary Angry Mom outbursts of physical and emotional abuse. From a traumatic, devastating, roller coaster ride of a life, Diane manages to gain greater understanding about her mother. 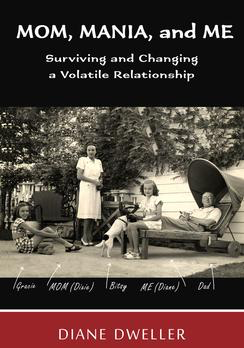 She develops survival behaviours and discovers significant insights into managing her mother. With greater self-esteem and confidence she overcomes fears and her burden of pain. She finds ways to deal with her unfaithful first husband and other difficult people and eventually begins to love her mother. By sheer determination and courage Diane has triumphed over her highly critical mother who was rarely medication compliant. Diane shares several gems of wisdom. Dianes experience highlights significant ways in managing a parent with mental illness. Wonderfully written, Dianes compelling account of her childhood struggle with her moms mania/bipolar illness is highly recommended. Anyone managing a parent with a mental illness and all those who know someone experiencing mental illness would appreciate the insights which Diane shares with us in Mom Mania and Me. Professionals in the fields of Mental Health, Justice, Family Welfare and Family Violence must read this book. The National Network of Adult and Adolescent children who have a Mentally Ill parent/s. World Association of Young People and Others who have a Mentally Ill parent.